I’ve come to the conclusion lately that cauliflower is an underrated vegetable. Mostly, I used to think it was just plain boring- and yes, when you steam it and serve it plain, I think there is nothing worse. Its lack of color is another one of its pitfalls- a white veggie on a white plate – need I say again… boring! But its all about how you cook it and fix it up that makes you realize, cauliflower is far from boring. This cauliflower recipe would make a great addition to your Thanksgiving or Holiday meal- the brightness of the apple is pleasing to the eye and gives the dish a hint of sweetness. The nutty taste from the browned butter and toasted pecans give it that holiday essence and amazing flavor that is sure to please even the picky eaters! Spread the pecans on a rimmed baking sheet and toast in a 350 degree oven, tossing occasionally, until fragrant, 6 to 8 minutes. Let cool, then roughly chop. Heat the oil in a large skillet over medium-high heat. Add the shallot and cook, stirring frequently, until softened, 3 to 4 minutes. Add the cauliflower and ¼ teaspoon each salt and pepper and cook, tossing occasionally, until golden, 4 to 6 minutes. 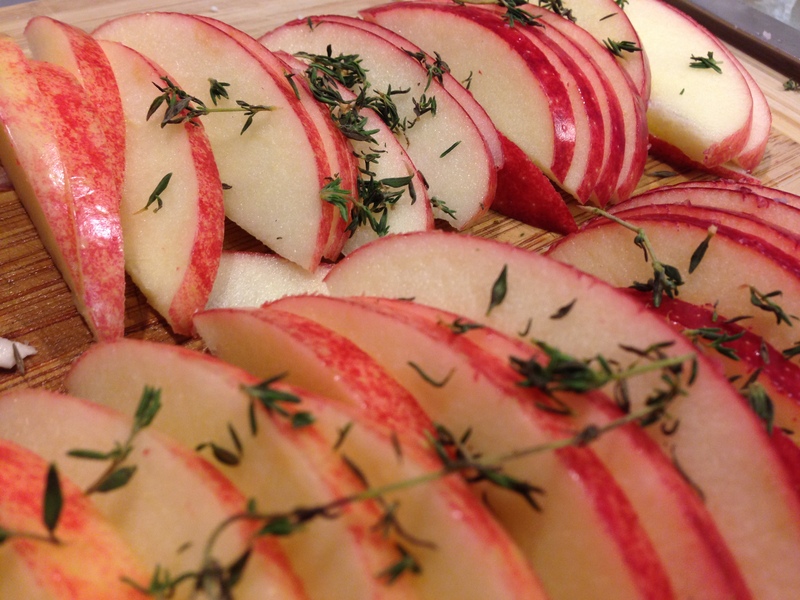 Add the thyme and ½ cup water. Cover and cook 5 minutes. Add the apple, cover and continue cooking until the cauliflower is tender, 5 to 7 minutes more. Remove from heat and transfer to a serving bowl. In a small sauce pan melt butter on low heat until its completely melted. Once it is fully melted raise the heat to medium-high stirring constantly. The butter will begin to foam and brown. Once the butter has reached a medium caramel brown color remove from heat. 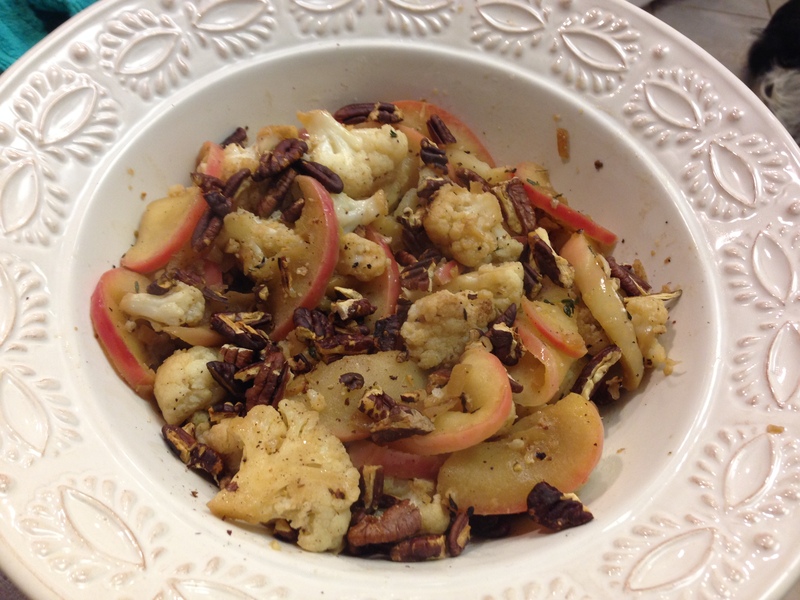 Pour browned butter over Cauliflower and toss and sprinkle with the pecans. This entry was posted in Holiday Dishes, Sides and tagged apple, cauliflower, Pecans, Thanksgiving side dishes by skibootsinthekitchen. Bookmark the permalink.